Total global oil trade steadily increased by 4.7% pa up to the US recession year of 2007, stagnated through the financial crisis but resumed growth in 2010, albeit at a much lower rate of 1.4% pa. In 2014, growth was only 0.5% while the volume of trade reached a record high of 56.7 mb/d. 22.9 mb/d (40% of the global total) were imports into Asia, a whopping 9.6 mb/d up from 13.4 mb/d (30%) in 2001. That is +740 kb/d pa. Where did this oil come from? Out of these 22.9 mb/d of Asian imports some 15.1 mb/d or 66% came from the Middle East, making Asia absolutely vulnerable to what is happening there. After the financial crisis in 2009 Asia’s total imports increased by an average of 4.7% pa (2014: 3.4%) while imports from the Middle East increased by only 2% (2014: 1%). This means that Asia has diversified its imports into West Africa, the Former Soviet Union, South & Central America and others. 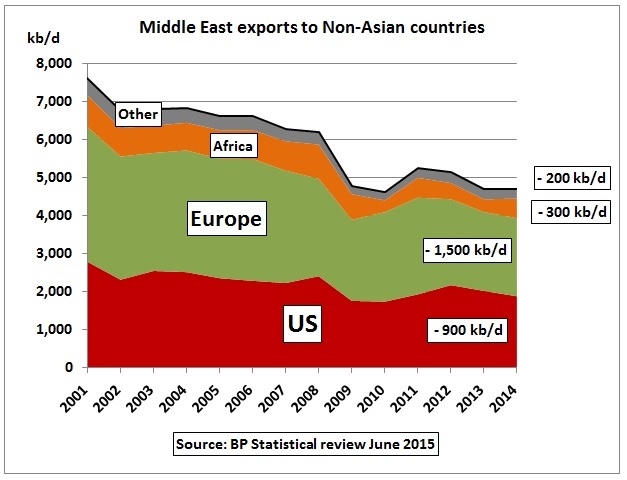 The share of the Middle East of total imports has therefore decreased from 73% in 2010 to 66% in 2014. 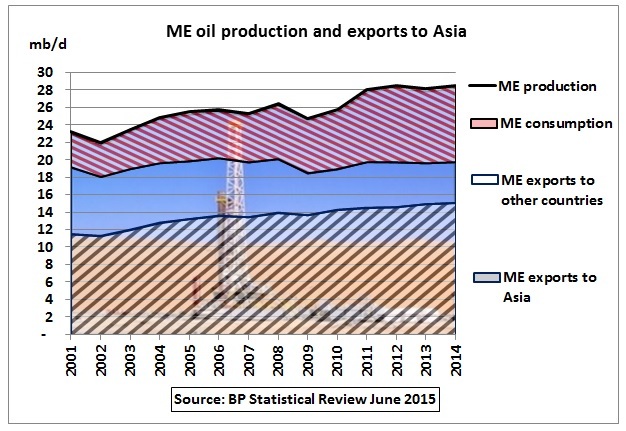 Despite this export stagnation, Asia was able to increase its imports from the ME to 15.1 mb/d in 2014, thereby increasing its share from 60% in 2001 to 76% in 2014. Middle East exports to the countries in the above graph decreased by a total of 2.9 mb/d. This oil was snatched up by Asia. 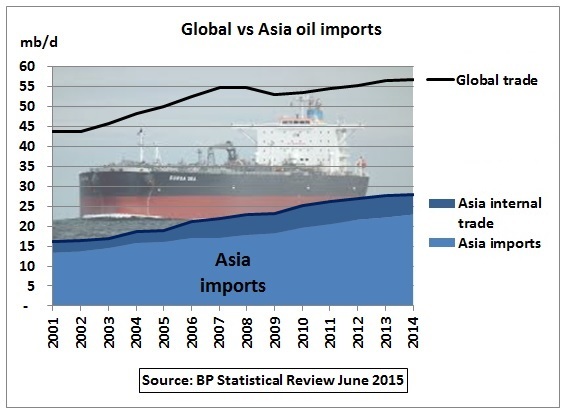 BP’s ME export data are only available from 1980 and Asia’s import data from 2001. 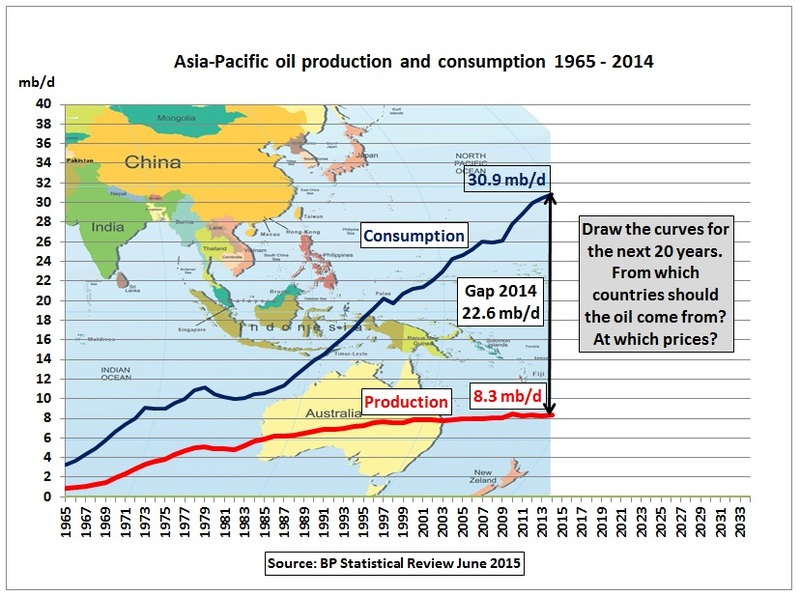 Oil production and consumption data start in 1965. So instead of taking data from the trade tables, the difference between production and consumption is used as a replacement for net exports/imports, as shown in the next graph. 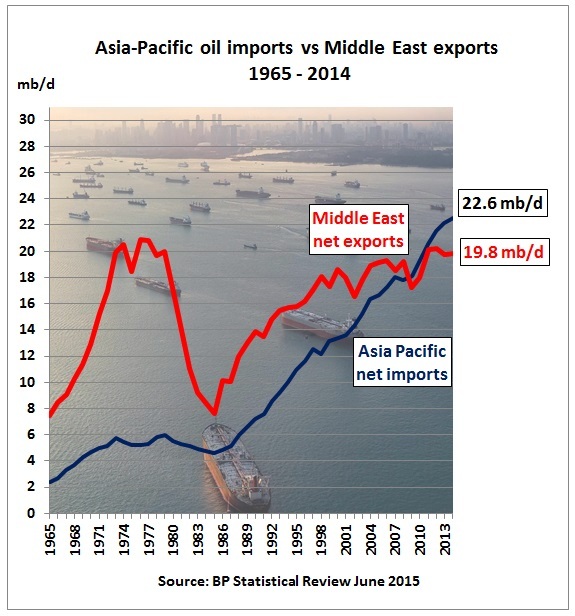 We can clearly see that Asia’s imports have grown beyond the export capacity of the Middle East which appears to be stuck around the 20 mb/d mark. If Asia cannot increase imports from other regions in the world (see Fig 3) economic growth will be limited. 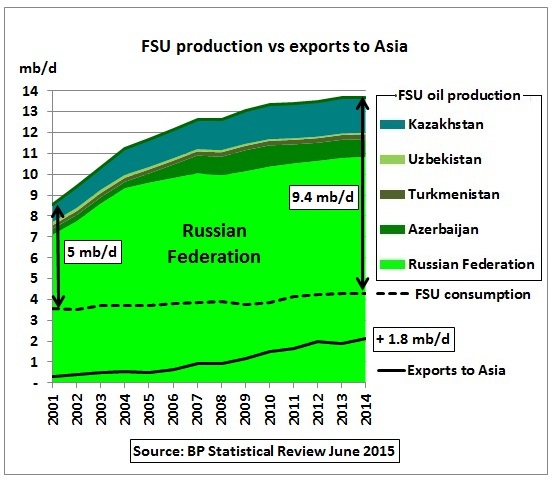 Fig 8 is also showing that FSU oil production growth is slowing and is likely to peak when Russia peaks. Azerbaijan is already at peak. 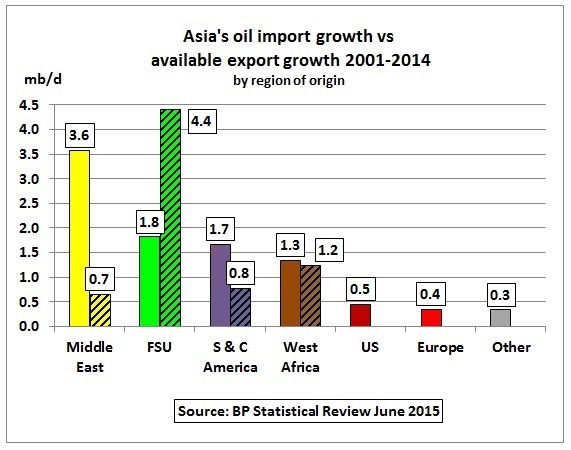 At the same time, Asia’s imports from the FSU were growing at 12% in 2014. In the last 4 years Asian imports jumped by 610 kb/d while FSU production increased by only 340 kb/d. FSU oil consumption grew at a modest 1.5% pa in this period. 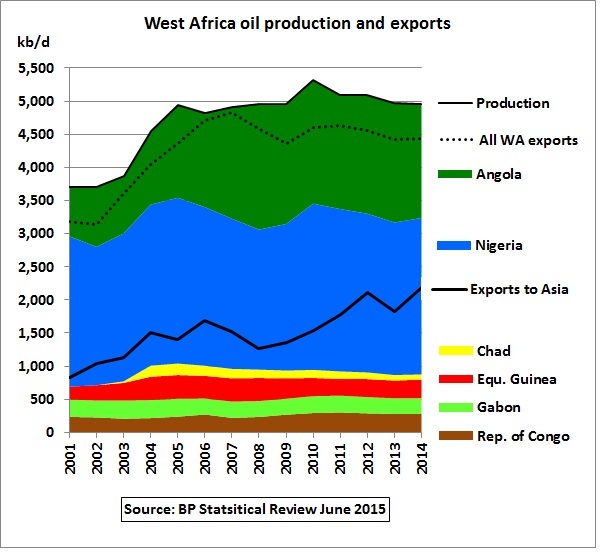 West African oil production peaked in 2010 and has been declining slightly. 90% is exported. 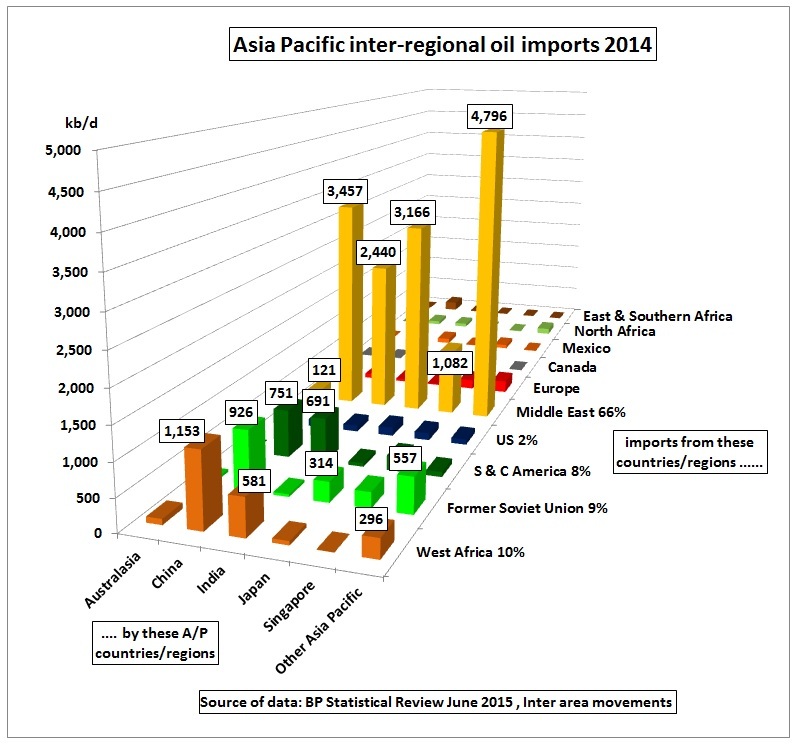 Asia increased imports by 1.3 mb/d between 2001 and 2014 while West African exports went up by 1.2 mb/d. This means only a net 100 kb/d came from replacing Non-Asian imports. But the real change happened in between. US imports peaked in 2005-2007 at 1.9 mb/d and dropped between the recession year 2008 and 2014 by 1.5 mb/d to 0.3 mb/d, mainly by replacing imports (of light oil) with domestic shale oil from 2010 onwards. The beneficiaries of these changes were Europe (+0.6 mb/d) but much more so Asia with +0.9 mb/d. 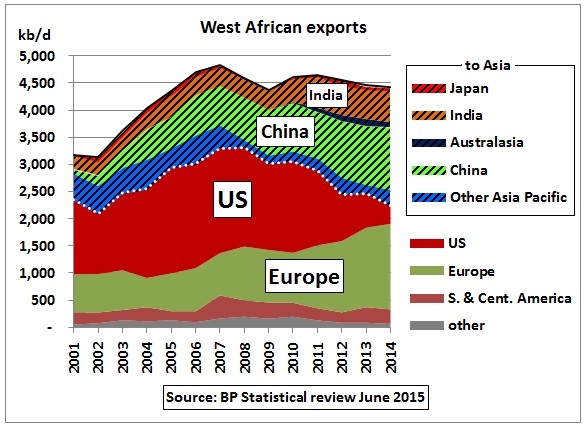 However, since the US import replacement has not much more to go, the fight for the West African oil cake will be on between Europe and Asia. 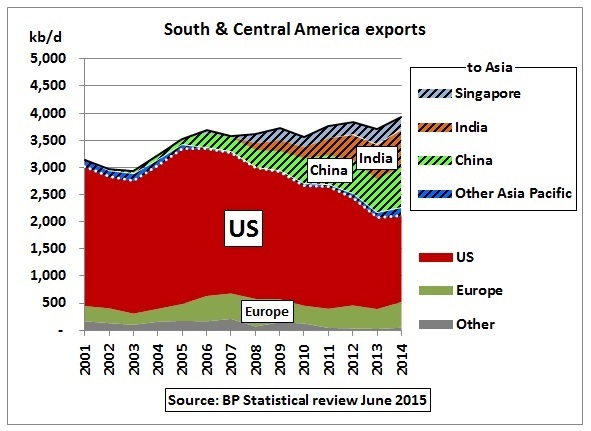 When US shale oil production drops – requiring more US imports – things will get more complex. Total oil exports increased by 0.8 mb/d. Asia could increase imports from 0.1 mb/d in 2001 to 1,800 kb/d in 2014. The difference of 0.9 mb/d came mainly from US imports dropping. Let’s put all this together. This graph shows where Asia’s incremental 9.6 mb/d since 2001 came from. The left columns show the additional imports into Asia, the right columns (hatched) show the export growth available as a result from production growth in the respective regions of origin. Note that the 3 regions on the right side of the graph are net importers of oil and have therefore no export growth available. The total of 1.8 mb/d of Asian import growth came from FSU production growth, mainly in Russia. 0.1 mb/d import reduction in the US. They are all net importers. Therefore, the combined 1.2 mb/d of Asian import growth came from decreasing consumption in these countries. Note that the above numbers have been arrived at by comparing 2014 with 2001 and that the percentages calculated below would be somewhat different if cumulative production were to be used instead (topic in a future post). 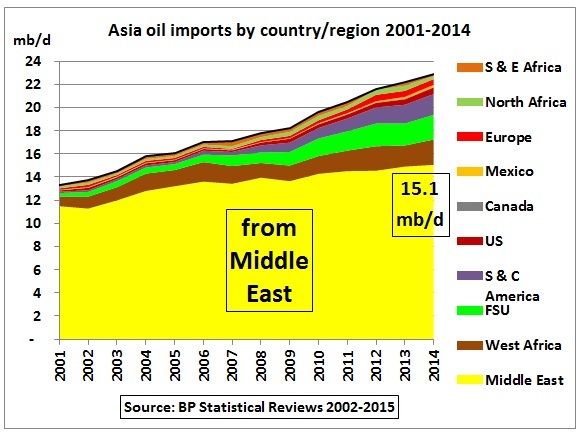 Of Asia’s total incremental oil imports since 2001, 4.5 mb/d (47%) have come from production growth, 3.9 mb/d (41%) from taking away imports of other countries (US, Europe, Africa and others) and 1.2 mb/d (12%) from direct consumption decline (US, Europe and others). 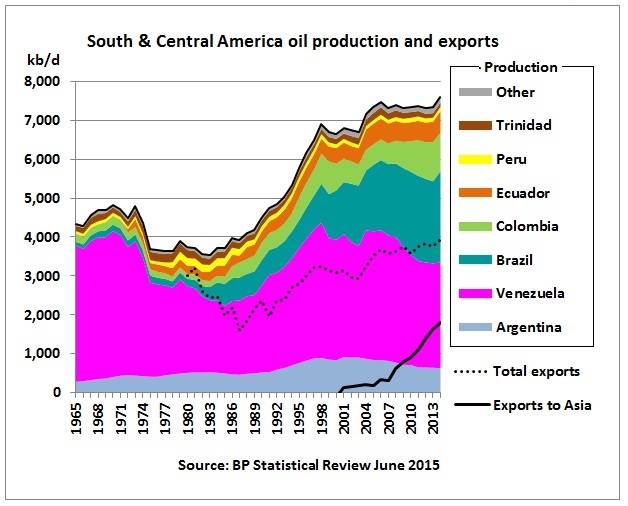 Most of the oil production increases were one-off and can no longer be repeated. 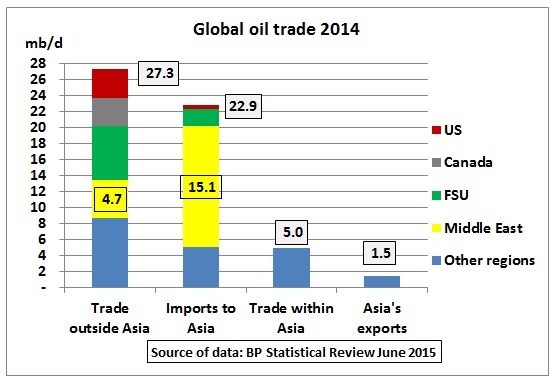 And how much longer others can save oil only to be consumed in Asia, is also a big question.